Readers of this blog have been aware of a certain back and forth on the issue of China’s current geopolitical posture vis a vis the United States. I’ve argued that China is anxious over the Obama administration’s rollback against Chinese economic and diplomatic penetration in the Middle East and Africa and the forthcoming high-stakes fracas over the RMB exchange rate, and is seeking “strategic reassurance” that U.S. pressure on China will stop short of measures that will endanger the core interests and survival of the CCP regime. Specifically, China is looking for a U.S. reaffirmation that Taiwan and Tibet are the PRC’s internal matters. That reassurance was not forthcoming during the visit of the Obama administration’s top two China hands, James Steinberg and Jeffrey Bader, to Beijing last week. Instead, China’s position was re-spun in the foreign policy press as “China emboldened” i.e. China feeling its geopolitical and economic oats and trying to push for new U.S. concessions at the expense of the Taiwan government and the Dalai Lama. Wen rebuffed international criticism that China had become arrogant and was engaging in triumphalism—charges made after the Copenhagen climate-change summit talks ended without a binding agreement. I cover the Copenhagen debacle here (with a link to my article on the subject at Asia Focus). China could certainly be accused of engaging in self-interested obstructionism in the face of concerted Western efforts to push it toward a cap on total emissions, but the borderline racist accusation of “arrogant triumphalism” by uppity Orientals doesn’t really reflect the Copenhagen dynamic—or the initial anti-China spin (amoral, irresponsible money-grubbing saboteurs) that emerged from the confab. I guess in the run-up to the RMB clash, the anti-China PR brief has been put in more determined and capable hands. Those are pretty strong words for a head of state. I’m waiting for the Chinese press to trot out the “selling arms to Florida and encouraging the Texas independence movement” analogies to try to get the message across. But China will have to find other ways to cut through the informational clutter. Now, close your eyes and think of the one image that Beijing could produce to show that it was simply asking for a reaffirmation of the historic bases of U.S.-China engagement, and not sounding the battle cry for a new campaign of world conquest. 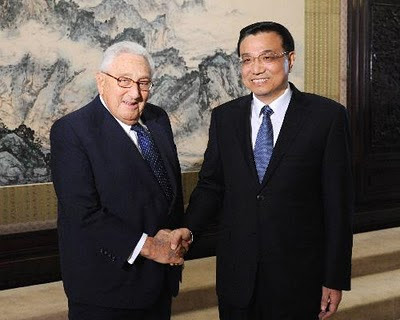 The embalmed corpse of Henry Kissinger, exhumed from the shag-carpeted Studio 54 annex to Chairman Mao’s tomb for a grip and grin with Chinese Vice Premier Li Keqiang this week in Beijing! But I think it would be safer to guess that China is openly pining for the halcyon 1970s, when Nixon and Kissinger cut off the guerrillas in Tibet, withdrew national diplomatic recognition from the Republic of China, and saw “rising China” as a useful adjunct to their geostrategic plans. A supposed source of the jiang shi stories came from the folk practice of "Traveling a Corpse over a Thousand Li " (千里行屍), where traveling companions or family members who could not afford wagons or had very little money would hire Taoist priests to transport corpses of their friends/family members who died far away from home over long distances by teaching them to hop on their own feet back to their hometown for proper burial. 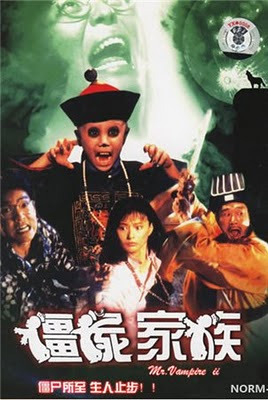 Taoist priests would transport the corpses only at night and would ring bells to notify other pedestrians of their presence because it was considered bad luck for a living person to set eyes upon a jiang shi. This practice (湘西趕屍) was popular in Xiangxi where many people left their hometown to work elsewhere. After they died, their corpses were transported back to their rural hometown using long bamboo rods, believing they would be homesick if buried somewhere unfamiliar. When the bamboo flexed up and down, the corpses appeared to be hopping in unison from a distance. Kissinger image from People's Daily; Zombie Family movie poster from www.goldtxt.cn. Your forever friend gets you through the haoxiod81 hard times,the sad times,and the confused times. eToro is the most recommended forex broker for newbie and advanced traders.